It has already been a busy season for Team Wild Heart. Our 124 Grand Market started back up for its seventh season, we’ve been securing new fun and exciting events, and for the most part, we’ve just been tackling the market head-on! In the month of May, we had four markets (already)! Each of them experienced odd weather, so we’re hoping that June brings us more sunshine. Our team has expanded to include three interns, Bert, our Assistant Market Director, Mac, our Assistant Market Director and Community Projects Coordinator, and Sush, our Communications Coordinator. These three talented gentlemen have helped streamline the market tremendously, and they have seamlessly become integral parts of our team. We are so grateful for them! Our new Sunday market expansion is opening on, June 3. This market day will see the return of our Little Beans program, so bring your Beans out and come to enjoy our new Sunday market! You can check out our weekly vendor list by visiting 124grandmarket.com. For the month of June, we have some truly exciting events coming up. On June 13th Eats on 118 returns! Join us for this culinary tour de force that highlights the culturally diverse food and dining district that exists on 118 Avenue. Tickets for this event are available until June 10th. If you miss out, you will have to wait until August 29! June 17th we’re once again hosting the Parkallen Restaurant Pizza Buffet for Father's Day. Come and enjoy a mouth-watering buffet of Chef Joe's famous, award-winning pizza by the slice. Tickets are just $20/person. Kids ages 4-10 for $10. Ages 3 and under eat free. Come and celebrate father’s day with all you can eat pizza! Our events don’t end there, we have some great events happening later this summer! 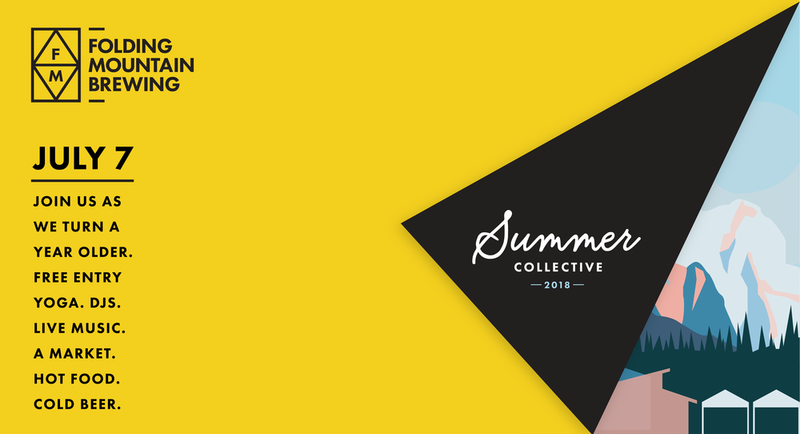 Join us, July 7th, to celebrate Folding Mountain’s first birthday with their Summer Collective! There will be yoga, drinks, DJs, live music, marketplace, food trucks, outdoor beverage garden, cold beer, and much, much more! Did we mention drinks? There will be drinks. Take a ride to the picturesque Folding Mountain between Hinton and Jasper and enjoy this incredibly jam-packed, and free, event. That’s right, it’s free! You’ve just got to get yourself out there. We're also now looking for vendors to populate our awesome open-mountain-air market, so if you want to be a vendor for this really awesome event sign up here. This year we’re partnering with Stonepost Farms, Camola Sustainable Foods, and award-winning chef Eric Hanson and Prairie Noodle Shop! An interactive, educational experience that will celebrate and promote local food grown and raised in Alberta. On Saturday, July 28, 2018 participants will be engaged in guided food tours including producers from outside our City's limits. Featuring tastings and other educational tidbits and a special farm to fork dinner you will not want to miss! Tickets for the Grand Taste Tour are available now! Transportation to Stonepost Farms is offered with tickets. That’s just a glimpse at the events we have planned for the next few months, but they are events you don’t want to miss. Of course, you can always come and hang out with us at the 124 Grand Market on Thursdays and Sundays. Stay tuned for updates and we’ll catch you on market street!